Food scares are nothing new: For years, the media has used terrifying headlines like "Potatoes: The Starchy Killer!" or "10 Common Foods That May Cause You to Spontaneously Combust" to frighten viewers and readers, and drive ratings. Last week, Dr. Mehmet Oz, host of a popular television show, took on apple juice, declaring that the classic American drink may be slowly poisoning the country's children with arsenic. As the FDA and the juice companies have refuted his claims, it is beginning to look like Dr. Oz's announcement may have been less a legitimate health warning than a cynical attempt to boost ratings. The battle began on Sept. 14, when Dr. Oz announced that his show had hired an independent laboratory to test for arsenic in several of the country's most popular brands of apple juice. According to the doctor, these tests showed that samples of four juices -- Apple & Eve, Motts (DPS), Juicy Juice (NSRGY) and Gerber -- contained between 11 and 36 parts per billion (ppb) of arsenic. Given that the FDA limits arsenic content in water to 10 ppb, Dr. Oz contended that these juices had unacceptable levels of the element. Soon after the show aired, Sen. Charles Schumer (D-N.Y.) called upon the FDA to issue clear limits for the acceptable amount of arsenic in juices. The senator noted that much of America's apple juice comes from China, a country with a "terrible track record" on food safety, and alluded to a 2008 incident in which shipments of Chinese pear juice were detained at the dock and tested for elevated levels of arsenic. Finally, pointing out that American growers don't use arsenic-based pesticides, Schumer gave a shout-out to his home state's growers: "a good option for juice makers and families who have concerns is to buy juice made from New York produced apples, which ... do not use pesticides with inorganic arsenic in them." A Real Threat, or Comparing Apples and Oranges? While Oz's claim was shocking, it's still unclear if it was actually legitimate. In the days following his show, the FDA, apple juice manufacturers, and numerous experts jumped into the breach to question Oz's assertions -- and what many regarded as his irresponsible fear-mongering. The first problem, as the FDA pointed out, is that not all arsenic is created equal: There are actually two forms of the element: organic and inorganic. Organic arsenic, which is a combination of arsenic and carbon, naturally occurs in many plants and animals, and is sometimes used in pesticides. According to the FDA, it is "essentially harmless." As an FDA spokesperson explained to me: "To date, scientific evidence does not show organic arsenic to be toxic to humans or animals." Inorganic arsenic, on the other hand, is both toxic and carcinogenic. A combination of arsenic and elements other than carbon, it can be released into the environment by industrial processes, volcanoes or forest fires. It's a common pollutant in drinking water, and the FDA carefully polices it. According to the FDA, Oz's tests lumped organic and inorganic arsenic together, which means that his conclusions were artificially inflated. Five days prior to the episode's air date, the FDA sent a letter to The Dr. Oz Show in which it pointed out to the producers that "the results from total arsenic tests CANNOT be used to determine whether a food is unsafe because of its arsenic content .... We have advised you that the test for total arsenic DOES NOT distinguish inorganic arsenic from organic arsenic." The letter went on to caution: "The FDA believes that it would be irresponsible and misleading for The Dr. Oz Show to suggest that apple juice contains unsafe amounts of arsenic based solely on tests for total arsenic." In spite of the FDA's criticism, Dr. Oz went ahead with the segment. After its first letter, the FDA ran tests on the same apple juice batches that The Dr. Oz Show had tested, but found far lower arsenic levels. According to the FDA, the apple juice -- which Oz claimed had 36 ppb of arsenic -- actually had a maximum of 6 ppb, an amount that put it well below the acceptable level for drinking water. 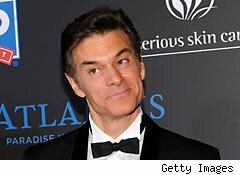 In a Sept. 13 letter that he sent to the show's producers, FDA senior science advisor Dr. Don L. Zink noted that the agency's results "do not indicate that apple juice contains unsafe amounts of arsenic," further cautioning "that it would be irresponsible and misleading for the Dr. Oz Show to suggest that apple juice is unsafe based on tests for total arsenic." While the FDA was testing, the four apple juice manufacturers also began damage control. Apple and Eve and Juicy Juice both tested the same samples as Dr. Oz, but found arsenic levels that were -- on average -- two thirds lower than those found by Dr. Oz's laboratory. Gerber, whose apple juice had the highest reported amounts of arsenic, also retested the juice samples in-house, but went a step further: It contracted two independent laboratories to run the same tests. Like the FDA, they found that the amounts of arsenic in the juice were far below the amounts claimed by the show and were well within the limits set for water. This isn't the first time that Dr. Oz has run into flack for questionable practices: in 2009, The New York Times took him to task for his association with "Real Age," a website that quizzes users on their lifestyles in order to help them develop a "grow younger" health plan. According to the Times, it also "acts as a clearinghouse for drug companies, including Pfizer, Novartis and GlaxoSmithKline," which use the site's data "to find people to market to." While Dr. Oz's work with RealAge may seem a little shady, it is hardly out of the ordinary. Doctors and pharmaceutical companies have long had cozy relationships. The apple juice scandal, on the other hand, smacks of bad science. Prior to the airing, Gerber notified Oz of their findings, noting that his assertion that their apple juice was unsafe "would simply be irresponsible, misleading" and would "without basis alarm consumers." In a similar statement, Motts echoed that media reports about arsenic in apple juice are "irresponsible and have needlessly alarmed consumers in the name of ratings." The FDA refused to speculate on any disciplinary or legal action that could be levied against Dr. Oz, noting that that was a question that would be better directed to Gerber. Gerber refused requests for an interview, but Dr. Richard Besser, ABC News' health and medical editor, made the point on Good Morning America. Accusing Dr. Oz of "manufacturing a health crisis based on faulty, incomplete data," he said that the brouhaha "reminds me of yelling fire in a movie theater."